Restoring the Thurston Canal could start with removing broken-down cars from the right of way. 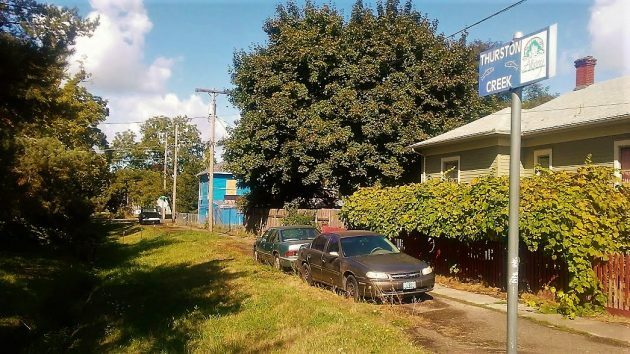 CARA, Albany’s downtown urban renewal program, is once again looking for what to do next, so how about finding a way to renew the neighborhood east of Lyon Street, especially around the Thurston Canal? The program’s last major retooling since its start in 2001 came four years ago. In 2013, after a year or navel gazing and policy meetings, the advisory board of the Central Albany Revitalization Area began making decisions on its future. Eventually, the outcome was the current $8 million reconstruction of selected core area sidewalks and streets. So at the CARA meeting on Sept. 20, the board was encouraged to start thinking about the next big project. Mayor Sharon Konopa urged members to start reviewing the list adopted when the urban renewal district was created. And Ed Hodney, in charge of CARA staff work, said he’d suggest a framework by the next meeting on Oct. 18. The CARA list contains 51 separate projects, acivities or ideas. Among them is the “Thurston Canal Esplanade,” though a year or two ago the board tried to ditch the term “esplanade” as being too, well, precious. The project list envisions this: “Develop a pedestrian/bike way along Thurston Canal with increased water flow, reopening (the) canal, riparian filtration, pocket parks and pedestrian amenities.” Sounds inviting, doesn’t it? Especially in comparison to what’s there now. The main idea behind CARA is that public improvements will lead to upgrades of nearby private property as well. This would lead to a more stable and prosperous community, not to mention more tax revenue, eventually, for all the local governments. 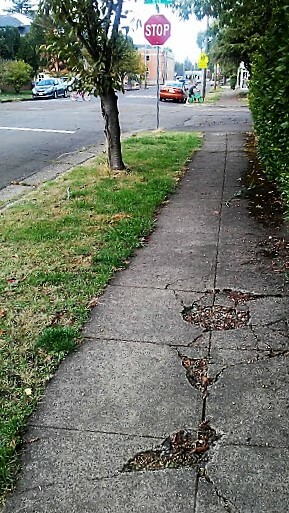 Sidewalk damage on Jackson Street near Fifth Avenue. I can’t wait to see the due diligence (ROI calculation) on this project showing the expected tax increment. But, as is the way of CARA (and you), a simple declaration will probably suffice. Spending other people’s money is so easy and such fun. 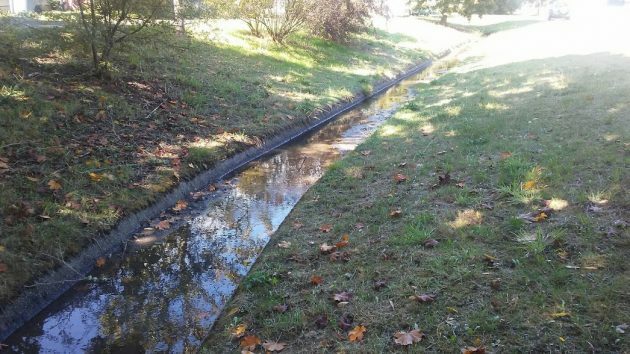 And who has jurisdiction over this artificial waterway? The State? Good luck with that. Finally, I assume “ditch the term esplanade” was an intentional play on words. It got a smile out of me, and I rarely smile when it comes to CARA. It is only “other people’s” money when one doesn’t live in the community. For me, it is OUR money. I like the idea of improving things. MAGA, right!?!? I like the idea of restoring the canal. But at the top of the list should be restoring the historic Queen Anne church at the corner of Main and 4th. You know that CARA uses TIF, right? Tax Increment Financing (TIF) siphons tax revenues from the taxing districts. To determine if TIF is an appropriate use of public money, CARA must consider whether the financial benefits of the project (its tax increment) outweigh the negative impacts of siphoning money away from essential services. There are several methods that can be done to show whether a project will be financially positive or negative. What specific financial analysis was done on the church project and what was the result? Are you saying the money CARA siphons from the city’s general fund isn’t for “essential services”? Wow, that’s headline material. I remember back in November 2014 the city’s Budget Committee was scrounging for money to increase the general fund. The City Manager (Wes Hare) told the committee that one potential source was to under levy CARA. In that tax year alone CARA siphoned $745K from the general fund. Money that would have gone to police, fire, library, parks, etc….all non-essential, evidently. Mary Edmonds sent this comment via email: Thanks for the great piece about the canal! I live on 4th and Jackson (Skipton house) and would love to see the city turn their attention to our side of town. A handful of us in the Hackleman (District) are trying to keep things looking decent over here, but it’s an uphill battle!